“I walked up the road and got out the two bottles of wine. They were cold. Moisture beaded on the bottles as I walked back to the trees. I spread the lunch on a newspaper, and uncorked one of the bottles and leaned the other against a tree. Bill came up drying his hands, his bag plump with ferns. 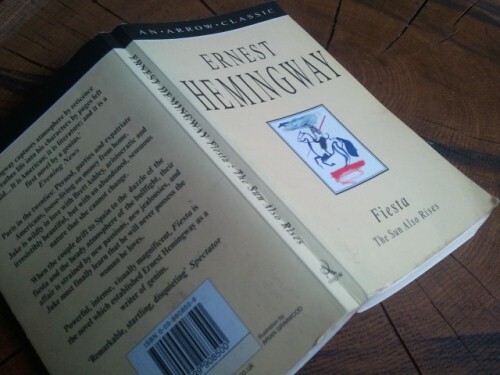 Quotes taken from the Arrow Classic publication of Fiesta: The Sun Also Rises by Ernest Hemingway, 1994, pp.106-110. If you really don’t want to go to a bricks and mortar bookshop to get a copy, then allow us to recommend our friends at Dialogue Books who have a great website, a curated selection of books, and will deliver to wherever in the world you might be. This entry was posted in Books on December 30, 2011 by Paul Scraton. This is one of my favorite scenes in all of literature. Loved reading your wish to experience it too.